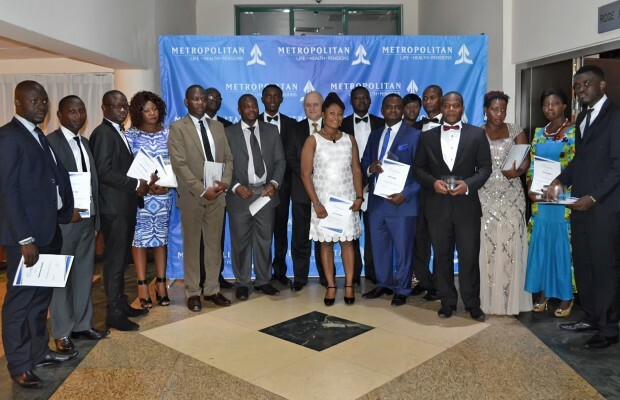 Metropolitan Group of Companies has rewarded its employees at an awards ceremony dubbed, ‘Night of the Stars’ in Accra. The three employees, who excelled in the year under review, will embark on an all–expense paid trip to Cape Town, South Africa. Patrick Tekpor was adjudged Best Performing Link Officer while Vida Bervell won the Best Performing Corporate Accounts Manager. Patrick Quarcoo was also adjudged Best Sales Agent. The hardworking winners would also visit the parent company of Metropolitan – MMI International at Parc du Cap in Belleville to interact with colleagues and learn how to improve their performance. Speaking at the event, Alhaji Dr. Abdul Rashid Pelpuo, Minister in-charge of Public Private Partnerships, stated that the government has done a lot to improve the fortunes of the private sector and would do everything possible to strengthen the private sector, especially players in the financial services sector to ensure that they help grow the nation. Dr. Pelpou said measures were being put in place by government to ensure an improvement in the country’s economy for businesses to thrive and propel the growth of the nation. He applauded Metropolitan for helping to develop the financial sector in the country and providing employment to many youth. The CEO of Metropolitan Life Insurance and Executive Director of Metropolitan Health Insurance and Metropolitan Pensions Trust, AJ Kruger, said although new ideas such as Bank Assurance were gaining root in the industry, the penetration rate was still low. “It has become imperative to motivate the sales channels to take advantage of the low penetration to ensure the ultimate benefit to clients, Metropolitan companies, the industry and the Ghanaian economy as a whole,” he said. Mr. Kruger added that the current economic downturn was posing many challenges to businesses, including the insurance sector. “The need for insurance and savings products to cover the risks of the unknown becomes even more imperative in challenging economic times. The need to provide for inevitable occurrences such as death or disability and the need to provide for future expenses such as a child’s education, health, income protection for the family, as well as planning for retirement do not reduce with a reduction in the growth rate of the economy. On the contrary, the importance of these needs is highlighted during difficult times,” he said. He therefore urged the sales teams to take advantage of opportunities to assist clients plan adequately for their financial wellness through the companies’ various wellness solutions. Gras Savoye Limited was also awarded the Best Broker for the year while All Risk Consultancy Limited placed second. Various awards were presented to back-office and support employees, who excelled in the past year. Peter Quarcoo of the Koforidua office emerged the Overall Best Retail Sales person for the year while the Life Corporate team of Emma Ocansey and Vida Bervell won the corporate award. Other winners were Daniel Doe, Best Zonal Manager and Seth Sorgah, Best Branch Manager. James Baiden–Amissah, Rita Zongbil and Daniel Sackey were adjudged best workers for Life, Health and Pensions operations respectively.